This movie will not tell you about any blackjack techniques (as The Hot Shoe for example) and will not remind you about any blackjack books (as The Hangover did). Croupier will describe the life of a dealer: you will be able to see pros and cons of dealers' profession and understand this job better. 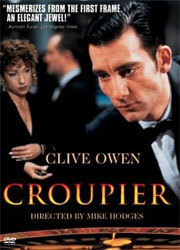 Croupier is the film of 1998; the hilarious performance of Clive Owen makes it to be worth watching for everyone who is interested in gambling. The young English writer Jack Manfred (Clive Owen) can not find his place in this world and he decides to take a job of a casino croupier in order to make the ends meet. Thanks to his father's connections, Jack becomes a dealer at the Golden Lion Casino in London. He is rather good in doing this job because he had a lot of trainings but he is a little bit bored because of it. One day Jack's attention has been caught by one lady - a gambler from his casino whose name was Jani (Alex Kingston). Actually, it is prohibited to do for a casino croupier - to pay attention to a particular player - but Jack begins to see Jani outside of his job and finds out many interesting facts about her. It appears to be that she has a big debt and she is under her creditors' pressure now. Jani asks Jack to help her and do everything for her to win at the casino he works. But Jack understands that it will not be as easy to do as it seems to beâ€¦. Croupier shows us the life of a casino dealer and discovers the casino's policy: dealers are prohibited to communicate and have relations with other casinos' employees, strict rules of behavior etc. Jack does not like this situation first, but soon he begins to observe everything through "Jake's" (the character of his book) eyes. This method helps him to do some things he would never do himself.